Zhang Yimou is one of China’s most prolific filmmakers. His classics have earned five Golden Globe nominations for Best Foreign Language Film, including To Live, Shanghai Triad, Hero, House of Flying Daggers and The Flowers of War. Zhang’s visual style is renowned for its cinematic splendor and artistic refinement. In his filmmaking career of 40 years, Zhang also discovered and nurtured new talent who went on to become international stars such as Gong Li and Zhang Ziyi. Besides filmmaking, Zhang also directed the unforgettable 2008 Beijing Olympics Opening Ceremony, which secured Zhang a place in world history. To honor this creative genius who often draws inspirations from China’s cultural heritage, Chinese netizens gave Zhang a highly celebrated nickname – the “National Master”. Shadow marks a return to Zhang’s most recognizable wuxia form. The story reimagines the classic Three Kingdoms of China and tells the story of Pei Kingdom’s unusual fight to reclaim the Jing region. The young King of Pei (Zheng Kai) is a reckless ruler who cowardly leads the kingdom to an uncertain future. 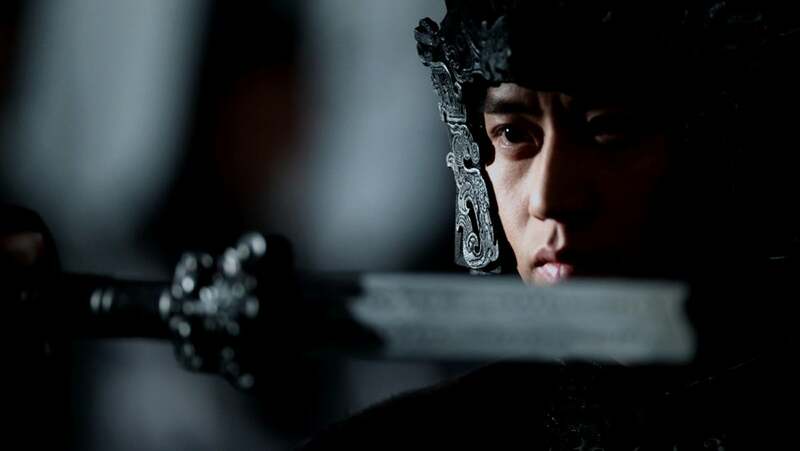 His Commander (Deng Chao) longs for nothing more than to win the ultimate battle versus General Yang (Hu Jun) of the Jing region. The King of Pei fears that General Yang will start a war against his kingdom, so he orders the Commander to keep the peace. But all is not as it seems. The Commander has secretly challenged General Yang and was badly injured in the battle. The person the King and everyone believes is the Commander is a stand-in, raised and trained to behave exactly like the real Commander who hides in the dark waiting for his chance to overthrow King of Pei and defeat General Yang. “This is a film about a body double,” said Zhang, “a concept that I have always been interested in, one that opens the door to explorations of power relationships, the duality of human nature and the quirkiness of fate.” As the story unfolds, the Commander’s shadow starts to question his own identity and his longing for Commander’s wife Xiao Ai (Sun Li) who is the only person to understand his emotional struggles. Zhang’s lens captures Xiao Ai’s emotional complex journey as she is forced to make choices between her enraged husband and the much more loving look alike. The visual style of Shadow serves the story’s exploration of dualities within and without us. Inspired by the inkbrush painting techniques, Zhang Yimou worked with his long-time cinematography collaborator Zhao Xiaoding to create an original aesthetic for the film. Chen Minzheng’s lavish costuming and Horace Ma’s exquisite art direction decorated the film with rain-swept exteriors and silk-flooding interiors. On November 17, Shadow won four prizes at the Golden Horse Film Awards – the Chinese language version of the Oscars. Zhang Yimou won Best Director and the film bagged another three technical awards. The film also premiered in prestigious slots in the Venice and Toronto international film festivals this year.